Instant message a user to get to know them before you Webcam chat, and add them to your contact list. This videoconferencing software also works behind most firewalls and routers. Camfrog Video Chat allows multi-user videoconferencing where you can join a room with up to 1000 users and just click a user name to begin seeing someone. Press the 'talk' button to talk to the entire room with audio. 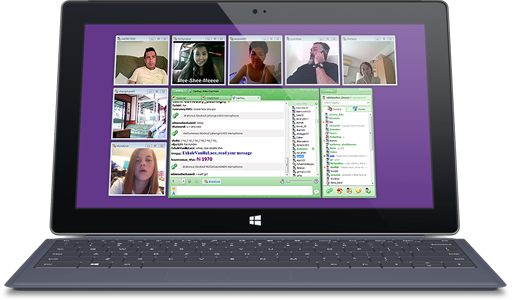 The video chat rooms are hosted by broadband users who are running the Camfrog Video Chat Room Server software so any user can set up their own multi-user video conference for other users to join. It's a small download, only 8.7MB. It takes under 15 minutes to download with a modem connection. Ponds - Private group video chat with up to 3 people for FREE members and up to 8 people for PRO users. Better Acoustic Echo Cancellation for P2P/phone calls.